The Emergency Incident Record Book© - EIRB© fills the need for a definitive record for all staff involved in emergency duties. Designed for individual post holders, it allows a legal record to be created for future reference. This enables an organisation to fulfil its obligation to have a record of information received and actions carried out for a period of a duty or for a more protracted and complex emergency incident, information about which may be contained within a number of books. Designed for diverse applications including Private Hostpital Control teams, Incident Commanders, Coast Guard, Accident Investigators (CAA and similar) and Local Authority Emergency Planners. When used for a Duty, the book can be a record for one individual for a duration of days or weeks, depending on the amount of information received and action taken. It is a personal record, similar to a police officer's pocket note book. Hospital Care Trusts and Ambulance Services in the UK now use CWC Services' log books for their on call and emergency response. Together with the Firstaidform© (designed for first aid staff and first responders), CWC Services' log books are designed as a coherent group of products for dealing with incidents, injured persons and the administration of emergency incidents of any scale. CWC Service's log books are designed for incident teams as well as managers, planners, administrators and other executives. The EIRB© can be used for any large scale or Major Incident (MI). The EIRB© will be a record of several, even many, individuals who might carry out the role over a period of time. If for a large scale incident, the EIRB© will be a record for an incident manager during the period of the incident. Several managers performing the same role might use the same EIRB© during a Major Incident, particularly if the incident lasts over a protracted period of time. An Incident Control Team from an organisation should ensure that each incident team member has their own EIRB©. In organisations like hospital trusts, action card holders would fill in their EIRB©s during an incident. 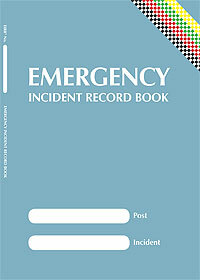 All Emergency Log Books© and EIRB©s used during an incident would, together, form the organisational record of the incident. The entry number (sequentially from 1 – n) can be used to mark any other document which relates to that entry, emails, phone messages or other documents. This enables a subsequent analysis to be accurately carried out. If one book used for a role or incident is used up, the sequel book should start with the n+1 entry number and the number of the sequel incident book identified on the last page of the first incident book. All entries should be initialed to ensure an accurate and complete record. The book can be filled in by a “loggist” or administrative assistant, but the role holder or incident manager must initial each entry to signify that it accurately reflects the information received and action taken. If a senior officer/manager should inspect any EIRB© he/she should make an entry in the book and leave a signature and initial on the appropriate page. The EIRB© will form part of the organisation’s record of a role holders/incident manager’s information received and action taken. It should be securely held for a minimum of 7 years after the end of the incident with all other EIRB©s, Emergency Log Books© and other records. The unique number of the books will enable any specific EIRB© and/or Emergency Log Book© to be retrieved from storage for information about an individual’s, role holder’s, incident manager’s or organisational actions during the period in question. Best practice in record keeping is the 'gold standard' towards which all Loggists should aim. Judges expect that Loggists will comply with this standard as do enquiry Chairs and Coroners. A comprehensive record must be kept of all events, information received, decisions, reasoning behind those decisions and action taken. Each responsible manager should also keep his/her own records, either personally, or assisted by a Loggist. It is important that a nominated information manager be made responsible for overseeing the keeping and storage of the records and files created during the response and also for ensuring the retention of those records that existed before the emergency incident occurred and immediately afterwards. This also applies to Emergency Incident Record Books© (EIRB)©) used by on-call managers to record issues, information received and action taken in an incident or Emergency Pocket Log Books© (EPLB©). Your entries must be C I A – Clear Intelligible Accurate. Relevant information should always be recorded in official Log Books. Write in permanent black ink. Write legibly. Avoid blue ink. Your record must be contemporaneous. Use a new Log Book for each incident. Ensure you note dates, times (use the 24 hour clock) places and people concerned. Record any non verbal communication. Do not put your own interpretation on that non-verbal communication. Only note down facts. Do not assume anything, give your own comment or give your own opinion. Entries in the record must be in chronological order. Unused space at end of a page must be ruled through with a diagonal line, initialed by you, dated and timed. Record all questions and answers in direct speech. Unused spaces at the end of lines must be ruled out by you with a single line. Mistakes must be ruled through with a single line and initialed by you. Any mistake you make which you notice at the time of writing must be ruled through by you with a single line, initialed and the correct word(s) added after the mistake. Overwriting or writing above the ruled through error must not be made. If you notice a mistake or an omission in the record later, during the debrief, or at any other time, you must tell your senior manager and the mistake must be corrected or the omission made good. Cross reference the mistake (in red ink) to the corrected entry on the next available page using letters from the alphabet, consecutively. Make clear references to exhibits (such as maps, flip chart pages, etc) and other documents so that it is clear in the record which particular exhibit is being referred to. Each series of entries must be signed off, dated and timed at their close. Loggists should sign off their notes at the end of their shift to ensure the integrity of the record.